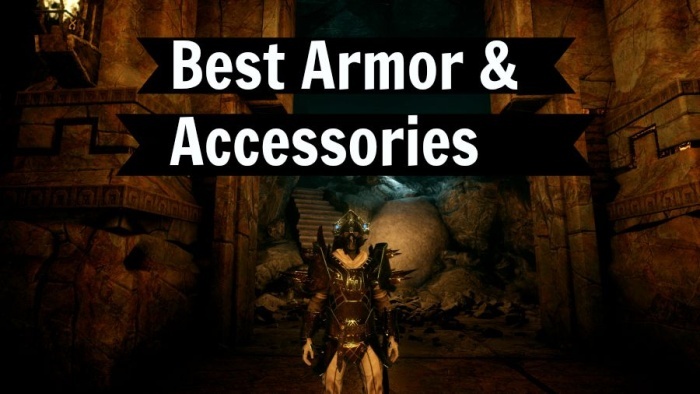 For today’s post I’ve put together a list of the best armor, helmets, belts, rings, and amulets for each class in DA: Inquisition. Hope you guys find this useful! 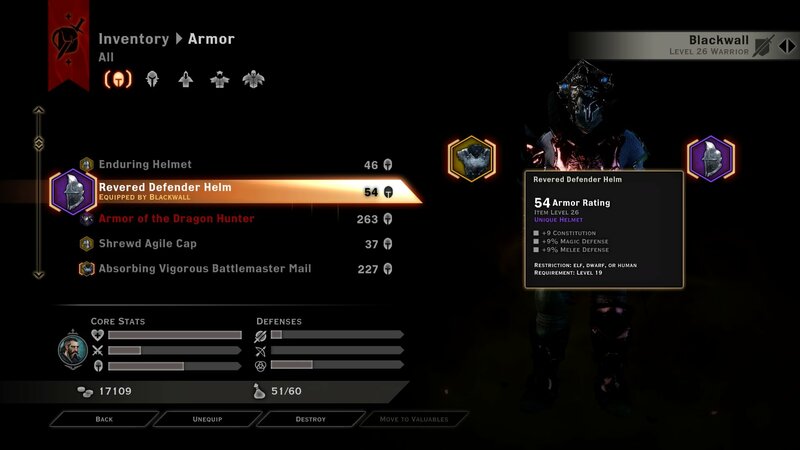 The items are color coded – Red color means the item requires the standalone game or the Black Emporium DLC (free), Teal for Jaws of Hakkon, Orange for The Descent, and Blue for Trespasser. The = sign means the items are so close that the better choice will depend on your particular gear/build/preference. The -> sign means “better than”; this is especially important for rings because you will have to divide them up among different party members so you may not always be able to get the best ring for every companion. Armor specifically designed for DPS warriors is scarce because you want as many metal utility slots as possible for adding +strength, as this is the only crafting stat on armor that actually boosts your damage. 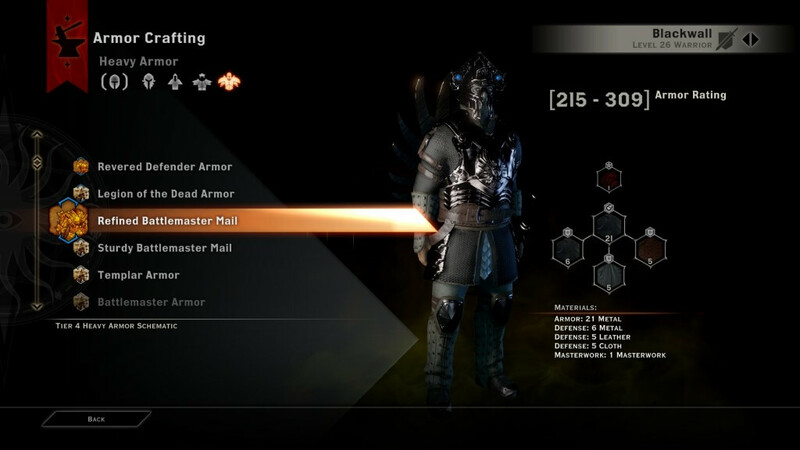 This makes the battlemaster crafted armor the best choice with its 2 utility as well 2 upgrade slots. For the upgrades, make sure to use Battlemaster Armor Arms & Legs to get up to 32 additional strength purchasable from the Hissing Wastes merchant, and the appropriate masterwork. This belt increases your attack speed when health is below 50%, making it ideal for Reaver warriors. The belt of focus is the only offensive belt option, so it’s an easy choice. This belt will make you generate focus faster so you can cast your focus abilities more often. The Superb Ring of Critical Chance will be the most difficult item to find. It appears to drop randomly from any chest/container that has a chance to drop a unique accessory item. Stacking attack is generally the best thing to do for DPS warriors, although critical strike chance is also a very good stat that will benefit from two key passive skills in the Two-Handed tree – Flow of Battle and Shield-Breaker. This amulet restores health and stamina whenever a nearby enemy dies, which is incredibly good for a Reaver warrior. DPS Warriors tend to have issues with stamina because of relatively high-cost abilities, so increasing your maximum stamina by upwards of 60% is very helpful. The Refined Battlemaster Mail is the best armor for tank warriors, thanks to 3 defense slots totaling 16 materials, as well as 2 upgrade slots for an additional 24 materials. The Superior Battlemaster Mail and Coat are slightly behind the refined, losing only 2 crafting materials (total of 16 versus 14). Be sure to use either The Battlemaster Coat or Battlemaster Mail Arms & Legs upgrades (these are random schematic drops, so using a schematic farming method is a good idea). The revered defender helm unique and schematic are pretty close, but I would use the unique because of the slightly higher armor, and because past a certain point, increasing your constitution isn’t that important for tanks. This belt provides you with up to 40 extra maximum guard. Since guard is by far the best defensive stat in Inquisition, this belt is a no-brainer choice for a tank. 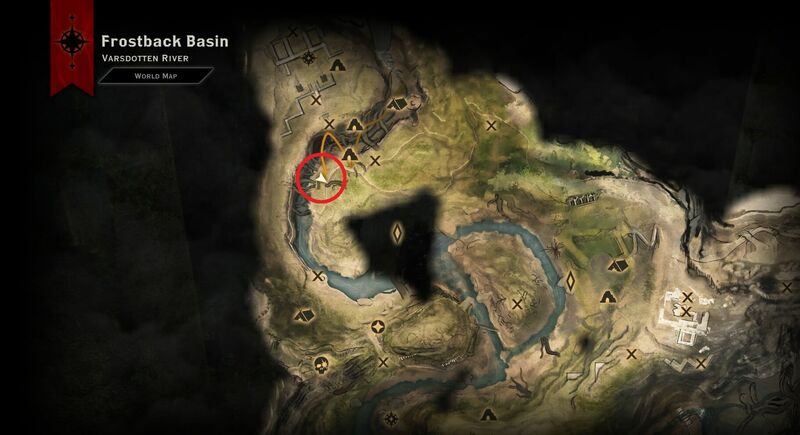 Location of the Master Guard Belt in Frostback Basin (JoH) – Found on a corpse in the northwest part of the zone. This is a simple choice because life drain is one of the only defensive effects in the game. It allows you to heal to 10% of maximum health when you land a killing blow on an enemy, so it’s an obvious choice for a tank. For the second ring slot the ring of staggering is ideal, giving you a chance to stun enemies on hit. For tank warriors, reducing cooldown times is by far the best Amulet effect, as it will allow you to taunt more often and never run out of guard. Just like DPS warriors, rogues want as many utility slots on craftable armor as possible, as that is the only crafting slot on armor that will actually increase your damage. This makes the Superior Prowler Armor schematic the best choice, thanks to 2 leather utility slots, as well as 2 upgrade slots. Make sure to use the Prowler Armor Arms (sold by Hissing Wastes merchant) & Hunter Coat Legs upgrades and the appropriate masterwork. The Skirmisher hat has 2 more offensive stats if you use a tier 4 crafting material, but you lose out on 9% magic defense and higher armor, so this choice is pretty close. Rogues want as much damage as possible, so being able to cast focus abilities more often is the best choice. The Flanking Ring is the best choice for melee rogues, because they benefit heavily from attacking from the enemy’s flank (side or rear) and already have a built in passive skill that gives them 55% bonus critical strike chance when flanking (Sneak Attack). After this ring, the critical damage ring is usually the best choice since your critical strike chance is already high. The ring choice for ranged rogues is less obvious and depends on your particular gear and build. For example if you already have high critical strike chance, then the Critical Damage Ring would be more useful than the critical strike chance one. Most importantly, if you’re playing Artificer you will want high critical strike so you can trigger your Opportunity Knocks passive more often, so the Critical Chance ring would be the #1 choice for that spec. 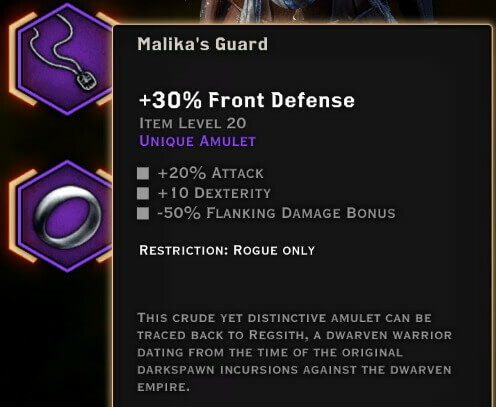 This amulet is a new addition with the ‘Relics of Thedas‘ items, and provides you with a large attack boost, dexterity, and also a frontal defense stat, while reducing your flanking damage. This amulet is only good for archer rogues because unlike their melee counterparts, they don’t rely on flanking for a large portion of their damage. As such, this amulet is a massive DPS boost for a ranged rogue, despite the -50% flanking damage stat. For melee rogues, the easy choice is to go for an amulet of Dexterity. However, if you find that you don’t really have any issues with stamina and are often waiting for skills to come off cooldown, the cooldown amulet can be a better choice. The Superior Battlemage Armor is the best choice for mages, largely due to its two utility slots, as well two upgrade slots. To make the most of this crafted armor, make sure to use Battlemage Armor Arms & Legs upgrades, purchasable from the Hissing Wastes merchant. For your masterwork, be sure to use either a damage-boosting masterwork, or a mana reduction one, depending on whether you have mana issues. The belt choice for mages depends on whether you’re having issues surviving or not. For example my mages tend to get sniped by archers and casters often, so I like to use a belt of ranged defense or a belt of health to help them survive. Otherwise I’d use a belt of focus as that is the only offensive belt option. For mages, the newly-added ring of doubt is by far the best choice; in fact, I would argue it’s the most powerful item in the game. 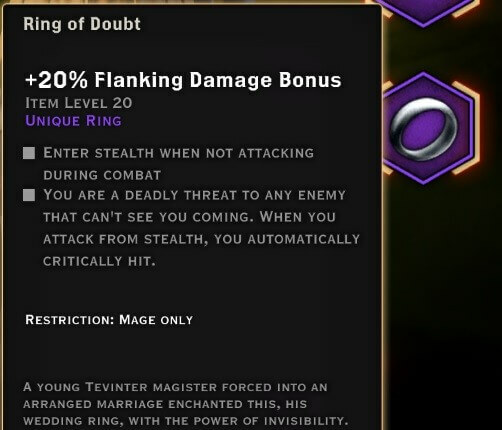 This ring allows a mage to go invisible during combat whenever he’s not attacking, and also gives a guaranteed critical strike for the first attack after stealth. Coupling this ring with Fire Mine upgraded with Flaming Array is a very potent combination, giving you 3 auto-crit fire mines. The rest of the ring choices for mages are similar to rogues and warriors since all 3 classes benefit from attack, critical chance, and critical damage. 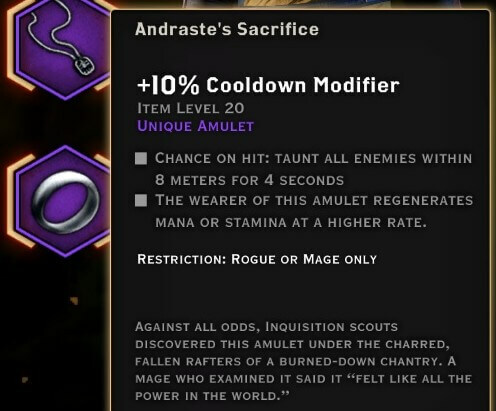 Andraste’s Sacrifice is another new Relic of Thedas item, and is also very powerful. This ring has two major effects: a chance on hit to taunt all enemies within 8 meters, and increased mana and stamina regeneration rate. The nice thing about using this amulet on a mage is that you can ignore the taunt effect, since you should always be as far away from enemies as possible. Meanwhile, the mana regen effect is incredibly useful for mages, especially for builds with high-cost skills like Static Cage, Fire Mine, and specialization skills. I’m playing as a 2h Templar using the build from this site. I have a question for crafting the battlemaster armor. What metal should I use for the utility slots? Dragonbone or Everite for its +7 strength? Same question for the arm and leg upgrades. Also what do you recommend for the defense slot for battlemaster armor and the arm & leg upgrades? If you want to stack DEX only, then the Superior Battlemage armor for the rogue is best. Your armor is only 244, but If you use snofleur skin on the one leather utility, and Avvar cotton on all the cloth upgrades (6 for the chest, and 8 for the arms and legs) then you can get a total of 46 DEX for your rogue. Is there any reason I can’t use ring of doubt on my dw rogue. wrong. dude. for a mage what you have listed is clearly inferior to the suburb shokra-taar with fade touched silverite for it’s masterwork. this is a classless heavy armor by nature so it doesn’t require using silverite to make it classless thus you can use tier four metals to get insane defense for a mage. combine that with the fade touched silverite which lets you generate 5 guard per hit the defense gets even better and with a mage thats able to generate barriers it becomes even more insane. boom mage tank. you can’t kill what you cant hit. and when you have a mage thats also able to revive any fallen companions it’s just more ridiculous. also, ring of doubt, ring of doubt is awesome. also, kittys collar might seem bad but its actually insane. just don’t put it on your tanks, put it on dps characters. so what if you have 100% more damage, it doesn’t matter when you almost always revive. if by some chance the dps person doesn’t revive from kitty’s collar boom, theres the mage to help out. I was wondering what the reasoning behind Superb Amulet of Magic being better than Superb Ring of Willpower is. I might be missing something key that will give me the answer but in my own experience barrier damage bonus, which magic gives you, tends to be pretty negligible. What about the pact belts for mages? Utter bargade. They give a slight damage increase to part of your kit at the cost of health that mages don’t have the luxury of losing. Not sure if anyone is still checking this, but what do you think of using using battlemage armor on rogues using rare materials to remove the class restriction? Comparing the Superior Prowler armor (with legs and arms) to the Superior battlemage armor (with legs and arms) I’m able to get more points into dexterity with the battlemage armor, although I lose a few points of armor. Prowler Armor has 9 leather utility slots, totaling 9 DEX + 9 CUN. Battlemage Armor has 4 leather utility slots, totaling 4 DEX + 4 CUN. Did you misread the cloth utility slot as leather? Prowler Armor Legs: Both defense. No utility. If I had been able to use Superior Battlemage Armor I would have even gotten more DEX. If you are going for a pure DEX/Crit Chance build this seems to be superior 🙂 Although you are sacrificing about 67 Armor Rating, you shouldn’t really be getting hit much. Avvar Twill has Willpower, not Dexterity. I just realized I didn’t take into account the Hunter Coat Legs, I didn’t know that you could use them with the Prowler Armor. They put the +DEX ahead of the mage schematic. I know it’s Trespasser only, but there’s always the Bind that Guides. 10% crit off a belt let me drop some crit off of other gear pieces for better stats. What do you say about Stone Stalker Coat unique version for DW rogue? The combination of no upgrade slots and the poor relatively poor masterwork make it not very good. Oh, nevermind. Looked at it in-game and it said reduced ability cost. My bad! For Rogue, the Leg upgrade should probably be Hunter Coat Legs as they have a 6 Leather Utility slot while the Hunter Mail Legs have two defense slots. Thanks for the tips, your guides have been most helpful. Making the Battlemaster Armor for my DPS Warrior. Should I go 7% sunder on hit or 7% ranged defense? For my defense leather slot? Also is it better to go with the plus 5 guard on hit or try to get a masterwork item with the bonus to stats? Depends on the character, but usually guard on hit is way better. The problem with the bonus to stats ones is that most of them don’t even have a 100% chance to be successful, so you may get nothing at all. Just a quick note for any class, but specifically for archer rogue. If you get to hard crit cap, 100%, its better to stack critical damage. Probably until a certain point, but what I have noticed is that in a few slots, you trade 10% attack, for 20% critical damage. If you crit 100% of the time, it is actually better. The particular instance I am thinking about is by dropping the ring of attack for the hand that cuts. Then just play with gear and get to like 99-100% crit as close as possible. What about Legion of the Dead armor? I have a dwarf, so it that better than the battlemaster for a tank? You will get more stats and the same armor from battlemaster because it has upgrade slots for arms/legs. 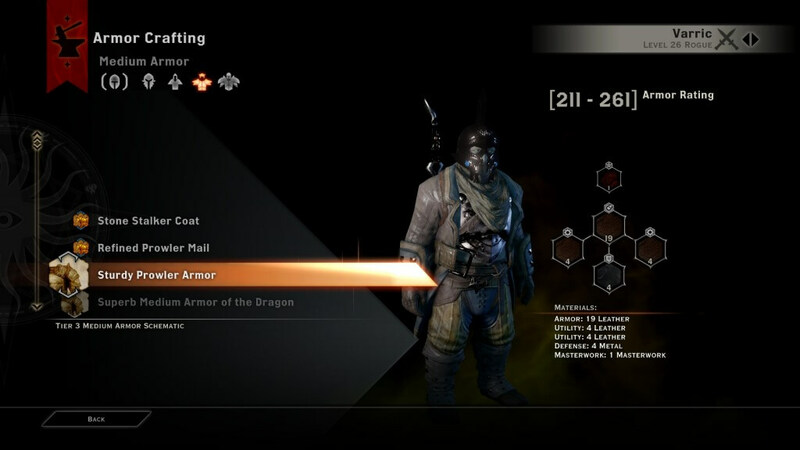 I initially though the same but the armor you mentioned is actually 3rd best for pure dps, the 2nd best is the Revered Defender Armor which is the exact same as the Superb Heavy Armor of the Dragon but with more materials thus better stats in amor and strenght too. The best one is indeed the Battlemaster Armor simply because even if it has lets stats by itself is the only one of these 3 that can have arms and legs upgrades. Not quite; I believe this piece doesn’t have upgrade slots, which put the battlemaster armor up and over. Something to keep in mind by the way. Trespasser items can in fact be used only while playing the DLC content, but Trespasser schematics can be transferred to all other characters using the golden nug statue that is also in the Winter Palace. I’ve checked the Trespasser schematics out and none of them are better than current stuff. However, I did add the new Trespasser items that were added to the base game. Weapons from Trespasser have built-in effects like Masterworks; while having Masterwork slots free. Remember that. What happened to Superb Antaam-saar? Was reading the article, refreshed and noticed that you changed the information. It’s not the best armor because it doesn’t have upgrade slots for legs/arms. With upgrades, the sturdy prowler schematic gives you a total of 24 cloth/leather utility, versus the Antaam-saar’s 20. Keep in mind the metal utility slots don’t help since they don’t boost DPS for either rogues or mages. Check out the comment chain under Stormreaver for more info. I have a question about mage armours. I tend to go for Refined Battlemage Coat Schematic from Stone-Bear Hold. It uses utility cloth, defense cloth and leather. So using tier 3 mats and +10% masterwork (sadly, need to change that) together with 2 upgrade slots (crafted upgrades using tier 3 mats Battlemage Armor Arms and Legs Schematic, as it has utility cloth as well as defense), I got armour with 38 magic, 26% to magic defense (which cannot be avoided, but then again is not so bad I guess) and depending which leather you use, you can get 10% chance to sunder attacker on being hit or 19 or 20 % elemental/ranged defense. While testing crafted Superb Antaam-saar with tier 4 mats (leather tier 3 since I can’t seem to get Imbued Tusket Hide if it even exists), I got 8 magic, 8 willpower, 12 dexterity, 12 cunning and 16 constitution (not using +10% masterwork). I know cunning and dexterity probably bests the defenses, but wouldn’t +38 magic be superior anyways? I updated the list so the crafted Superior Battlemage Armor is actually the best choice now. Your armor is the 2nd best after that. Also I hate the 10% stats Masterworks because they’re basically a lottery, so you may end up crafting an armor and getting no bonuses at all. Not to mention the DPS masterworks like +5 hits of Hidden Blades are better anyways. Yeah I tend not to use the 10% masterwork anymore since I managed to get more Fade-Touched ones. The guard one is a must. Someone suggested on some forum though, that the critical masterworks might work in the way, that the 20/30/40% chance of producing a better item is determined not while crafting the item itself, but when you loot/buy the masterwork. So while buying/looting the masterwork, it is determined if it will work or not. So the way I do is, when I get a bigger stack of those masterworks, I save before crafting, and first craft low lvl items with tier 1 mats one after another and check on which attempt the masterwork works. When I get it, I reload the save, and first craft low lvl items to burn out not working masterworks and then create the proper item. So for instance, while testing I got 3 normal items and the forth one is the one with the bonus, I reload and craft 3 of some tier 1 shield or helm and then, when I know that the fourth attempt will give me critical bonus, I craft the desired item. I get +12 to constitution, dexterity, cunning, & willpower, which gives Me bonuses to attack, crit chance, crit damage, HP, and melee defense. (currently, I’m sure it could be made better) With the Dragon Webbing, the armor, if coupled with the Fade touched Silverite, is sturdy enough. Oh yeah I totally forgot about the Spoils DLC packs. Thanks, will update that. edit: For mages, the Antaam-saar is the best armor by a slight margin. for rogues the choices are very close. For one thing, the metal utility slot doesn’t really matter that much since it only gives constitution (useless for DPS). I would agree with you that the Antaam-saar is still the best, but only for melee rogues. for the rogue you put as the second best, black emporium sturdy prowler mail, is it really that or did you mean superior prowler mail? good work you have here, it has been of great help for me. Hey glad you found it useful! 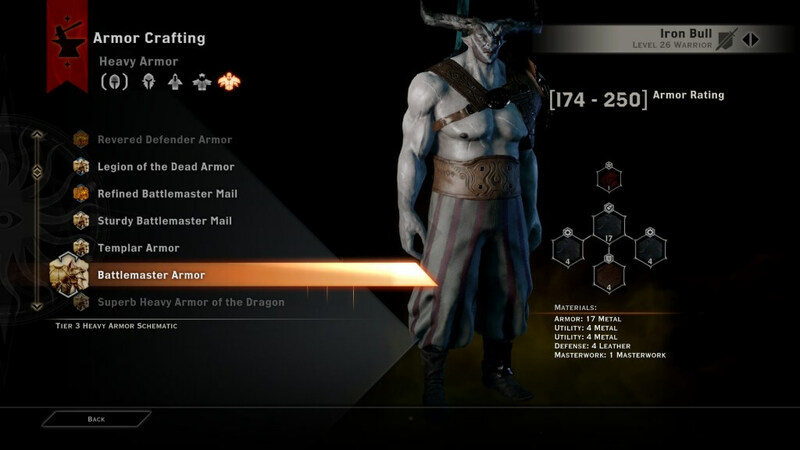 The problem with most chest armor in DAI is that it has way too many defensive slots. Defensive slots can only be filled by stuff like resistance, which is pretty much useless for DPS classes, especially when you can use guard on hit masterworks to take care of most survivability problems. So you have to “downgrade” if you’re looking for the biggest DPS boost. In this case, the sturdy mail has 2 utility slots (total of 8 leather crafting materials), while the superior one has only 1 (5 leather). This means you can get higher dexterity/cunning with the sturdy mail, which equals higher DPS. But what about upgrades? Battlemaster Gear with both Battlemaster boots and gloves is better than Descent stuff at everything. Thanks for bringing that up, I did miss out on the upgrades. Going to update the list now. However the descent stuff is still slightly better in most cases. For example when using the best possible heavy battlemaster arms/legs upgrades, here’s the comparison between revered defender armor (schematic) and refined battlemaster armor (schematic). 280 armor/28 constitution/20% magic def/18% ranged def versus 309 armor/ 22% magic def/9% ranged def/19% melee def. If you total that all up, the revered defender gives you a total of 52% defensive improvements (14% melee def from the constitution, plus 20% magic and 18% ranged) and 140 hp, versus the 50% total defense improvement of the refined battlemaster. Something wrong in this math, you can craft upgrades that are much better for tanks with 8 + 4 defensive slots. And have dps ones that have 8 utility + 4 defensive, and can be better than most of armors that cant have slots for upgrades. It apply for other classes too. Hmm I think you’re right. I was going off the upgrades I found on the dragon age wiki, but it looks like it is missing a lot of the upgrade items, especially the yellow ones; I just found a better one myself. I will have to go back and some more digging and I’ll update the list, thanks! For vanilla schematics I use this (http://dragonage3.wiki.fextralife.com/Schematics) site. The only class that dont have boots upgrade with 8 utility + 4 def is rogue, but you can use a tier 2 with 6 utility + 3 def. Ps. : I got a Critical Chance ring from chests that have a high chance of drop unique quality accesories during Descent DLC, just need farm them.